Each year the Upstate Institute recognizes one or more students with our Upstate Institute Award, given to students who have dedicated themselves to supporting our Upstate New York community with outstanding service and scholarship. We are proud to award the 2017 Upstate Institute Award to Chelsea Mohr! Chelsea is a senior Sociology major and Film and Media Studies minor who has provided research support to Madison County’s Community Action Partnership (CAP), an organization coordinating a range of social service resources to area residents. Chelsea first began her work with CAP though Associate Professor of Sociology Janel Benson‘s course on Community Based Research during the Spring 2016 semester, where the class worked with CAP to assess the results of a mentoring program pairing adult mentors with youth ages 8-16. Chelsea then continued this work during Summer 2016 through a research position (again supervised by Prof Benson) that partnered with CAP to assess the long-term impact of their mentoring program, by contacting alumni of the program, now in their late teens and twenties. 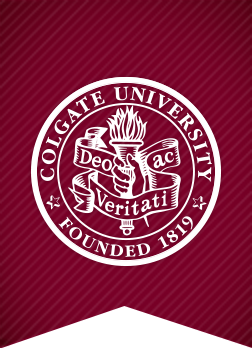 The results of Chelsea’s research demonstrated the effectiveness of the program, and, in turn, Chelsea and Prof Benson brought this research back to campus earlier this term, where they hosted a well-attended workshop for Colgate students about best practices for mentorship. Congratulations to Chelsea! And a big thank you to Prof Benson for your support and to CAP for your partnership on these projects. 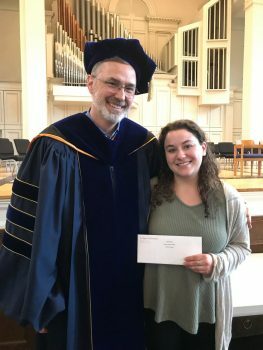 Chelsea Mohr ’17 (l), winner of the 2017 Upstate Institute Award, with Professor Chris Henke, Faculty Director of the Upstate Institute. You sound like a great guy! An athlete with such ambition is rare! Good luck!